This rig is designed to take advantage of a multihulls wide beam. It provides the safety and handling advantages of the standard FreeWing rig, while adding a new dimension to an already excellent performance. The Twin rig has two rotating wing masts that are stepped on the port and starboard hulls. There is a lightweight, low drag profile, compression strut linking the tops of the two masts. Each mast has a forestay and backstay that run diagonally, terminating at the bow and stern on the opposite sides of the yacht. The crossed diagonal forestays and backstays, working with the compression strut give both longitudinal and transverse support. No shrouds are needed for lateral support and thus the rig can rotate freely. The rig can be feathered to de-power whatever the apparent wind angle, and as with the standard FreeWing rig, reefing of the two mainsails is easy without having to change heading. 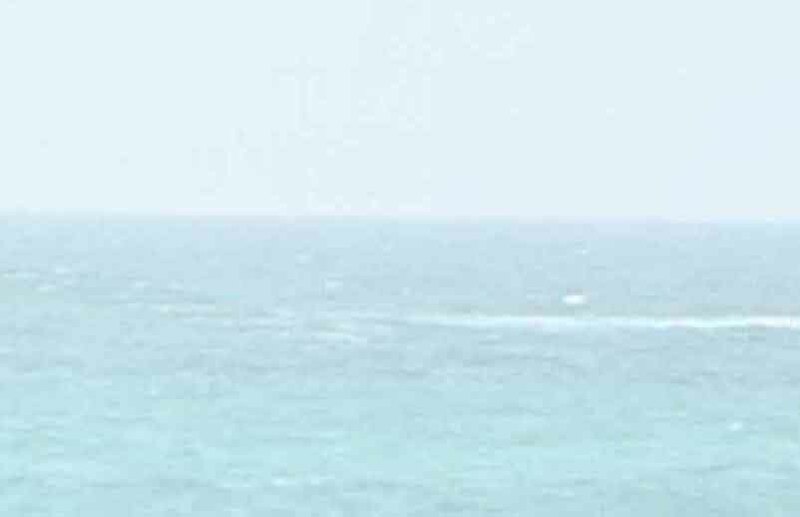 The full roached, loose-footed sails are fully battened and reef onto the boom. 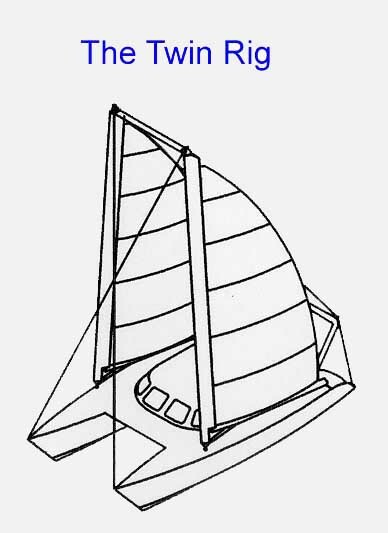 Sail handling can either be done from the mast position or the lines can be led to the cockpit. Alternatively, for the ultimate in easy handling, the sails can have vertical battens and be roller reefed into the masts. 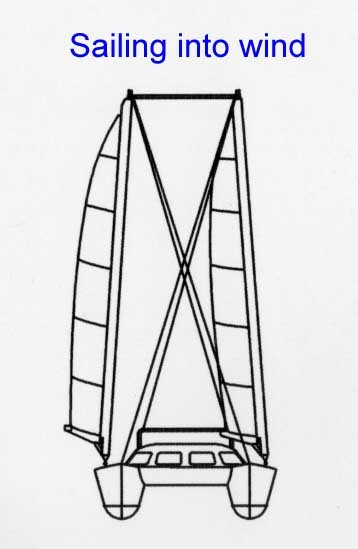 To provide clearance for full roached, fully battened mainsails, the backstays are lead to the stern via a rigid arched “goalpost”. The “goalpost” also provides a strong point eliminating the need for davits to raise and store the dinghy. It can also be used to support the bimini, wind generator etc. Racing yachts can replace the “goalpost” with a “deck-spreader” strut at the stern of each hull (saving a little weight and windage). In light weather masthead jibs or genoas can be used to boost the normal sail area. Off the wind, an asymmetric on the leeward mast can add even more sail area. These sails are easily handled as they are roller furled, and can either tack to the bows or to extending spinnaker poles, for even greater power. 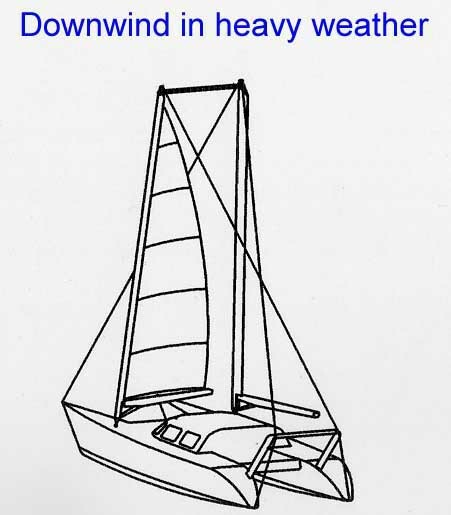 In moderate conditions the headsails are not required. The twin “una rigs” clean leading edges and high lift to drag ratio, provided by the rotating wing masts will enable the yacht to point very high and will provide plenty of power. With increasing wind speed, when on a long ocean passage, the sail area is reduced by reefing the weather mainsail first. As the compression strut linking the tops of the masts is shorter than the distance between the mast steps, the lee mast is canted to weather. The aerodynamic force generated by the leeward mast and sail will therefore provide some lift helping to raise the lee bow. For those interested in high performance sailing the lift generated in this way can be greatly increased by making the length of the forestays and backstays adjustable. The entire rig can then be canted at will and the rake can also be adjusted. This option allows the yacht to be pushed much harder, by reducing the pressure on the lee bow. In storm conditions both mainsails are furled and the yacht can be sailed using the masts only. The masts are very efficient aerofoils, generating a very high lift to drag ratio. In particularly strong gusts the masts can be feathered, the windage from the rig is then very low, much lower than that from a conventional fixed round mast. Feathering is possible whatever the apparent wind direction. Semi-rotating wing masts, with limited rotation can be dangerous when caught out with excess power in storm conditions, but the Freewing rigs can be successfully de-powered. Gentlemen sailors who never sail to windward will still benefit from the FreeWing Twins capabilities. Running downwind, the booms are set square to the centre line, or even a little forward of square, virtually eliminating the danger of accidental jibes. The centre of pressure is on the yacht centreline and well forward, greatly assisting steering control. In light weather, flying a spinnaker can fill the space between the masts. As no normal sail has to be dropped, the addition of the spinnaker greatly increases the total sail area. 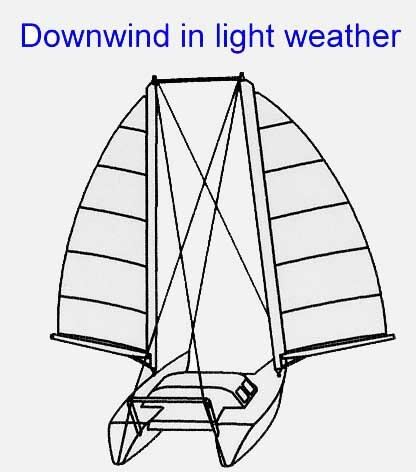 With increasing wind speed, the sails can either be reefed symmetrically or one sail can be dropped while the other is swung inboard to fly between the two masts. This set up maintains the balance of the rig and keeps everything inboard in heavy seas. The carbon fibre masts are very light because the compression loads are half that of a conventional rig stepped on the yacht centreline. The effective shroud base is the full beam of the yacht. Removing the mast from the centre line aids visibility and removes the huge bending loads in the crossbeam or bridgedeck, which bedevilmulti-hull design. The masts are deck stepped so there is no interference with the accommodation below. At anchor the rig is set with the masts angled slightly so that the leading edges converge. This makes the boat docile and helps to prevent it sailing around or snubbing at the anchor. In fluky wind conditions the wind pressure on the masts actively maintains the head to wind position. Windage from the rig is very low but if a hurricane is eminent or you need to pass under a low bridge the rig can be easily lowered onto supports on the “goalpost” without any outside assistance. To do so the masts are rotated and the outboard ends of the booms are lashed together over the bow. The mainsail halyard from each mast is attached to the outer end of its boom. A line is taken from the end of the booms to the deck and lead back to the anchor windlass. The spinnaker halyard from each mast is attached to the base of the opposite mast and then tensioned, in order to provide lateral stability. The two forestays are then uncoupled and by pulling on the backstays the mast can be tilted backwards while the line on the anchor windlass is eased. Raising the rig is just as easily accomplished, using the anchor windlass to pull the rig back into the vertical position. The FreeWing Twin rig is easy to handle even when short handed, yet provides the power needed for a sparkling performance, with an added sense of security.